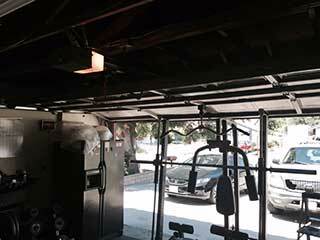 When some part of your automatic garage door system breaks down, it can be very dangerous and complex to fix it. Professional assistance is often required to deal with most of these situations. However, there are some important inspections and tests you can and should perform by yourself every once in a while, in order to avoid a lot of potential issues. First, you need to make sure the garage door is fully closed. Then you need to carefully inspect the springs and the cables for wear and tear signs. Look closely for any deformed coils or fraying sections. You should do the same for the tracks, rollers, and hinges as well. These can become misshapen and develop wear or rust, so checking them is absolutely crucial. Of course, if during this inspection you discover any damaged component, don't hesitate to contact our team right away. To do this you need to first close the door and then disconnect it from the opener, in order to be able to open it manually until it's halfway up. If the door rises up effortlessly without any resistance and is able to stay in place, then it is properly balanced. If lifting it is a real struggle, or if when you let go it doesn't stay in place but rises or lowers immediately, the tension of the springs needs to be adjusted. This test is essential for an automatic garage door opener. Place a wooden plank on the floor, right underneath the open door. Now try closing the door using the opener. Normally when the door touches the wood, it should automatically go back up after a second. If it doesn’t, then the force limit sensitivity needs to be adjusted. Another test that needs to be performed regards the safety sensors. These photoelectric eyes are installed on the bottom parts of the opening, usually attached to the lower sections of the vertical tracks. While the door is closing, swing a broomstick or any other object in front of the eyes. The door should start to reverse as a response. If the door keeps closing normally, then something is definitely wrong with these sensors. Seeing as their job is to prevent the door from hitting people or objects, they need to be looked at by professionals right away. This is a simple task that is often neglected, even though it carries tremendous performance benefits. A little lubrication (preferably white lithium based spray) on the steel rollers, hinges and torsion springs (if you have them) is a great way to reduce the wear these components go through. It will also minimize the friction based sounds that they tend to start making over time.